SCORE is a high-performing, low-thrust, gaseous hydrogen/oxygen rocket engine designed by ORBITEC to operate at a stoichiometric mixture ratio as part of the water rocket program being sponsored by DARPA for Earth orbit spacecraft. SCORE is a small (~20 lbf) on-orbit spacecraft rocket engine intended to serve as the primary thruster for the water rocket system. The water rocket calls for the use of liquid water as a propellant supply. The liquid water is electrolyzed on orbit into hydrogen and oxygen gas, which is then stored and used as needed for orbital maneuvers. Because the propellants are made from water, they are available in stoichiometric proportion, and the overall performance of the propulsion system is optimized by using all of the available propellant. This approach also eliminates complicated, heavy, and costly cryogenic storage systems while providing high performance. Other applications include reboost/repositioning for orbiting facilities such as the ISS space platforms or spacecraft. The water rocket has several major advantages over conventional stored liquid propellants such as MMH/NTO. It offers dramatically improved Isp, it is environmentally friendly, and its lack of toxicity simplifies launch operations. In addition to these advantages related to the propulsion system, the water rocket also doubles as a battery: stored hydrogen and oxygen gas may be converted back to water to generate electricity in a fuel cell during periods of darkness. The water rocket requires a long-life engine that can deliver high performance at relatively low thrust in the harsh conditions of high-temperature stoichiometric combustion. SCORE uses ORBITEC's patented cold-wall vortex flowfield to accomplish just that. 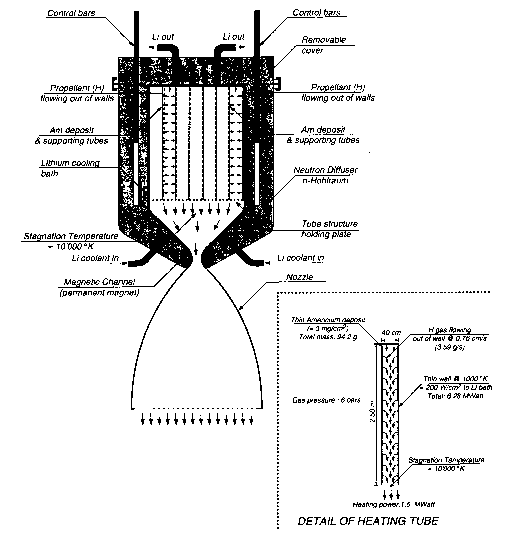 The vortex protects most of the chamber wall from combusting propellants, minimizing the heat load. Development work is currently progressing towards a flight-type engine which will be regeneratively cooled and will exhaust to simulated altitude conditions.